Who says you can’t go home again? On Thursday, UFC president Dana White announced they have re-signed former heavyweight champion Andrei Arlovski (pictured). “Welcome back Andrei Arlovski!” White posted on Twitter. As customary with all MMA contracts, terms of the deal were not disclosed. Arlovski was under contract with World Series of Fighting, but the rumor mill suggested the 35-year-old was released from his deal earlier today. Apparently, there was no need for “The Pit Bull” to rush to the unemployment line. Arlovski owns a 21-10 (1 NC) professional record and went 10-4 inside the octagon. The UFC let him walk after posting a TKO win over Jake O’Brien in 2008. The Belarus fighter proceeded to take fans on a roller coaster ride, at one point losing four straight, with three of those defeats coming via (T)KO fashion. 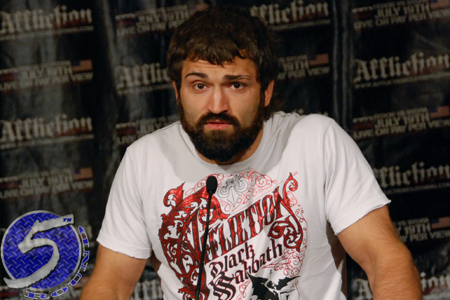 However, Arlovski has managed to right the ship going 6-1 (1 NC) over his last eight outings. No word on when Arlovski will break in his new UFC contract. So, is Tim Sylvia next?? ?